Is the Grey/Green Goo Brouhaha the Industry's Second Blunder? Issue: When Prince Charles raised concerns about the emerging revolution in nanotechnology at the end of April, tabloid headlines of Grey Goo were catapulted onto front pages of English-speaking press and elsewhere, raising the spectre of the great GM debate all over again. 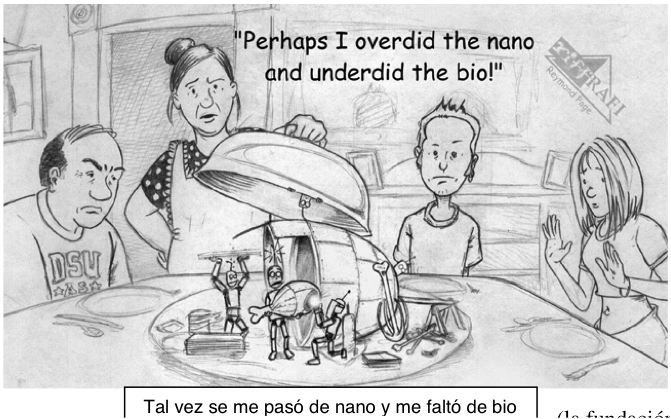 But nanotechnology – despite being one of the best funded new technologies in the world – is still little known outside scientific and business circles and is not regulated by governments. Scientists and industry proponents have attacked the Prince for having the audacity to raise concerns about the future impacts of atom-scale manipulations. The threat of Grey Goo (nanoscale mechanical robots reproducing uncontrollably) has become the itsty-bitsy boogey man, handily dismissed by industry and Nobel laureates as a technical impossibility. But in their zeal to pooh-pooh the Prince, they are ignoring the very real and present dangers that nanotechnologies pose, including the potential toxicity of nanoparticles and the farther-reaching implications of nanobiotechnology. Context: Even while the Grey Goo theory is being pressed into service as straw man, measurable scientific advances are being made that will make some form of molecular manufacture a reality sooner than anyone thought possible. Implications: We are not ready for this latest and greatest industrial revolution. Public debate about the societal implications of nanotechnology for the environment, the economy, labour, and democracy is paramount. We must establish laboratory protocols to protect workers from possibly hazardous materials, perform the necessary toxicology studies to find out where the specific problems are, and regulate nanotechnology research and commercialization to prevent an asbestos-like public health crisis or a Green Goo (nanobio) catastrophe. Policy: Prince Charles has reportedly called for the Royal Society to convene and discuss the implications of nanoscale manipulations. On June 11, 2003, a seminar at the European Parliament on nanotechnology intended for civil society, policy makers and the media will be held at the European Parliament in Brussels. Ultimately, governments must negotiate a legally-binding International Convention for the Evaluation of New Technologies (ICENT).